Indispensable attribute of the bride in a responsibleday in her life, is considered to be the bridal bouquet. It is for the bride a symbol of happiness, love and romance, which she will keep for many years, occasionally pulling it and remembering the day in her life. Because such a composition must be original, meet all the wishes of the bride and fit together and colors of celebration. Previously, the choice of bouquet for the bride - wasresponsible work of the groom, but now, as a rule, the bride choose their own composition, order attribute, not trusting this important moment anyone. And no wonder, because so many things you need to consider to get the original accessory, beautiful ceremony and the match as a whole. And also do not forget about the composition according to the groom and boutonnieres. Flowers. The first is to determine the colors - the choice today is enormous - from roses (which many would call trivial, but still - it's a classic) to orchids, lilies and lily of the valley. When choosing colors should pay attention to their season, better to choose a color that matches a particular period. Thus, the winter is better to make bouquets of roses, gerberas, roses, chrysanthemums, flowers in summer because winter frosts not long "survive." freesia, calla lilies, hydrangeas, orchids are ideal for a summer wedding. Why is it better to choose seasonal flowers? During their higher the quality of the season, the range is greater and the cost - below. The color of flowers. 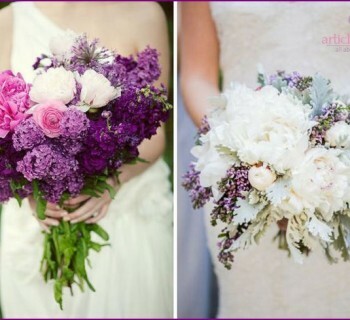 Choosing the type of flower, you must decide with their color scheme. It is worth to pay attention not to a few important points: first, the color composition has to overlap and match the color scheme in which decorated the wedding; a bouquet should look harmonious with the dress of the bride; Third, pick a color and is depending on the color of hair of the bride. So, blondes do not use bright, bright colors in a bouquet, so it does not distract attention from the bride, but also white, plain colors - also not an option, as will be merged. It is best to choose shades of pastel colors. For brunettes is perfectly suited bright colors (red, purple) or white, cream-colored shades. The form. One of the important points, because of the shape will depend on how the bouquet will look to the bride. Select the form is based on the style dresses and veils the bride, her figure and growth. Price. Last index, which draws attention to the bride. It is recommended to visit several floristic salons, compare prices and quality of services offered and opt for the best option for you. Choosing flowers for a wedding ceremonyhuge. They differ in color design, shape, and type of colors used. Every bride will be able to select and order an accessory, which she always dreamed of, and which will give the maximum of its internal state. Recently, quite often there are beaded bouquets, bouquets of satin ribbons or even candy. They look impressive, and most importantly, preserved forever in its original form. Bride peonies rarely consider as an optioncolors to compose the wedding. Some believe that peonies look very casually and just. But in the capable hands of a specialist, peonies can be transformed into an amazing song that will win the heart of not only the bride, but also give it to others. As a rule, peonies make out in a round bouquet. Choosing peonies, it is worth remembering - this seasonal flowersand find them perhaps in late spring to early summer. It is necessary to take into account the important point that when working with peonies should be particularly careful, as they are quickly dissolved in the warmth and the composition may lose its original appearance. Because to work with these colors, you must find a wonderful florist. Often in combination with peonies use other flowers (roses, orchids) and plants. Roses available all year round. Roses come in many shapes, colors and sizes. Excellent combined with other colors. Suitable for any image of the bride and under any model of the dress. Rose is very hardy and the composition of them allmaintain fresh day, a great form at the registry office, while walking and during the feast he did not change his views. Particular attention should be paid to Kustov roses, which are small buds and look great in combination with other colors or larger roses. As a general rule, make a bouquet of roses, a ball or a bouquet-hemisphere. 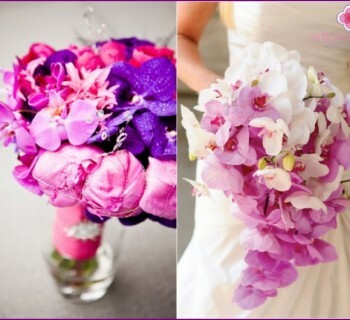 Orchids - flowers, which only recentlyIt has been used in wedding floral design, but already won the hearts of many girls. Orchids can be of different shapes and colors, so you can choose the kind that you like. These colors look great in combination with other flowers and greenery. Because orchids are doing cascading (cascading) bouquets. They look aristocratic, but the price is not cheap out. Callas - original flowers that despitesimplicity, it looks quite effectively and gently. Wedding bouquet of calla lilies will long retain its original appearance, because these colors are resistant to all weather conditions. Callas come in different colors, so you can choose the shade that best fit your outfit and make-up. Wedding bouquet of lilies and bright leavesoriginal. Prefer such flowers creative girls who want to stand out. As a rule, gerbera resistant to various weather conditions and retain their fresh appearance all day long. Songs made with lilies round or spherical shape. Daisies choose sentimental girl. Looks a bunch of cute and romantic, despite the simplicity of the colors themselves. The composition of the daisies, as a rule, make a hemisphere or a circle. Carnations - autumn flowers, because of their rich variety ofIt is in this period. Due to the variety of colors, you can choose the color of the carnation, which would fully meet the color design of the wedding. These flowers are quite hardy and are able to maintain excellent appearance throughout the day. Tulips particularly popular and in demandin the spring, when the season for them. The wedding compositions are used very rarely, but at the same time they look elegant and rich. Often, a combination of tulips with roses or other flowers. Find lilies of the valley you can only in the early spring,because if you are planning a wedding in October, it is pointless to dream of such colors as components of a wedding song. Watching these flowers are exquisitely. Often used for their isolation bright green. Lily of the valley is possible to use in combination with other colors - roses, calla lilies, crocuses and other. Selecting lilies of the valley, it is worth remembering that they have a specific aroma and should be careful that it does not cause allergies or unpleasant headaches. Chrysanthemums - different colors, which differendurance and a variety of shapes and colors. Combines such nice flowers with roses, gerberas, carnations. 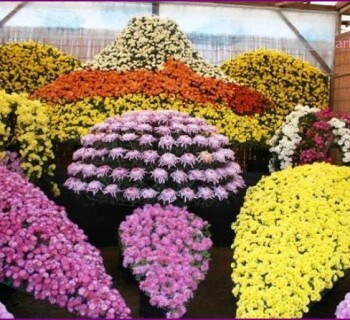 Ideal to use chrysanthemum in autumn, in this period, they are very beautiful and accessible. Wedding bouquets possible to produce differentforms, here, that your heart desires: the sphere, the cascade structure bouquet, drop, flower, spider, hemisphere, Biedermeier, glameliya. Alternatively, it is possible to make a bag, the fan, the coupling. For slender little girls better growthuse the classic small bouquets elegant form. In this case do not fit and massive elongated composition. For tall girls are ideal elongated, cascading and hanging. For brides with a curvy shape is best to buy round, lush flower arrangements. Depending on the style and the style of dress, it is worthremember that vertical composition more suitable for long, tight dresses; round - the classic version and will fit almost any dress, but will look perfect with lush; composition in the form of a fan or a handbag perfectly suited to the classic dress. To find out more information about the models dress and bouquet form, we offer to pay attention to the photo presented. Flowers - flower buds, petals, twigs. Satin ribbon or other decoration handle. The holder for the flowers. To get the original bouquet and mostthe best, it is often decorated with additional accessories. For example, using beads, dry twigs, feathers and twigs with berries used elements or artificial flowers. It all depends on your imagination and wishes. As a rule, decoration and handles lend themselves to flowers that decorate beads, satin ribbons or lace, which was used on the bride's dress. Often the bride bought a bunch understudy. What is it for? Firstly, the understudy is useful if, during a photo shoot your bouquet by adverse weather conditions (extreme heat or cold or wind) lost its compelling view or wilted like a sponge. Then understudy to help. Secondly, when the bride at the end of the evening is throwing a bouquet - it is better to use this bouquet-double, because it is usually easier. As a rule, bouquet-doubler made of lighter materials, often used artificial elements. With him go to the witness, while he will not need the bride. Most brides want to keep the weddingbouquet for many years, in fact I believe that it will provide peace in the home. If you want to save the song, you need to wrap it in a thick paper and put in a dark place for a month to a bouquet of dried, after you can put it in a vase or hiding in a box. Alternatively, it is possible to dry individual color elements - for example, only onto the head. Dry them and fold into the box, sprinkled with your favorite perfume. Every time when you open the box, you'll remember the most exciting and enjoyable day of your life. If you liked the article or you have something to add on, create and pick up a bouquet for the bride - leave your comments.